The NSA's RONIN is "a tool used to detect TOR-node IP-addresses." TOR is a software that enables online anonymity by directing traffic through an intricate network of relays that conceal a user's location. It's a powerful and free software which the NSA itself describes as "the King of high secure, low latency Internet anonymity," so it's not surprising that they would want to crack it. The word rōnin is Japanese, and it indicates a samurai with no lord or master. During Japan's feudal period (1185-1868), a samurai became masterless if his master died or was defeated, or if the samurai was cast out of his master's service for some reason. Many rōnin became mercenaries or bodyguards while others became criminals. I don't think I need to elaborate on the humor of the NSA using the word rōnin in any description of themselves. The more we learn about the NSA the clearer it becomes that they indeed serve no master. I modeled my rōnin on a print by Katsukawa Shun'ei, an ukiyo-e artist who lived from 1762-1819 in Tokyo. Shun'ei made a lot of prints of both warriors and kabuki actors, this being an actor playing a rōnin. Shun'ei tended to draw his figures in unusual positions, often curved as this figure is. On a related note, the 2011 American crime drama "Person Of Interest," which revolves around a former CIA officer who is recruited by a mysterious billionaire to prevent crimes in New York City, makes frequent references to rōnin and wandering samurai. Pickings were slim for the letter Q when I first began working on this project, but luckily Glenn Greenwald offered a wonderful Q word from the Snowden files in March of 2014: Quantumhand. 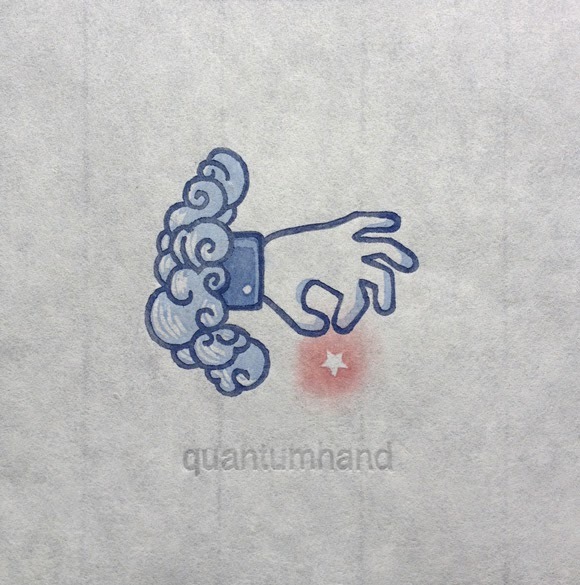 Quantumhand, a program which the NSA denies vigorously, is an initiative whereby an NSA computer pretends to be a Facebook server in order to infect targets with surveillance malware. You may have read articles recently about Facebook founder Mark Zuckerberg calling President Obama to complain about this. The revelation comes from several Snowden files, including the interesting (and typically ugly) powerpoint slide contained in this article on Greenwald's web site. - I'm pasting woodblock prints created using the Japanese method, called moku hanga or ukiyo-e.
- I use Guerra pigment dispersions rather than paint or ink. These are pure pigments suspended in water. - If you use any other kind of ink, sumi ink, ink jet, etc., always test before you try this. There are no guarantees that this method will work for your type of ink. - A steady hand is necessary, so ease up on the caffeine. - Rest the tip of the knife against the edge of the board as close as you can while still avoiding cutting into the liner washi. This takes some trial and error, but once you've found the angle that works, keep your hand in that position all through the cut. 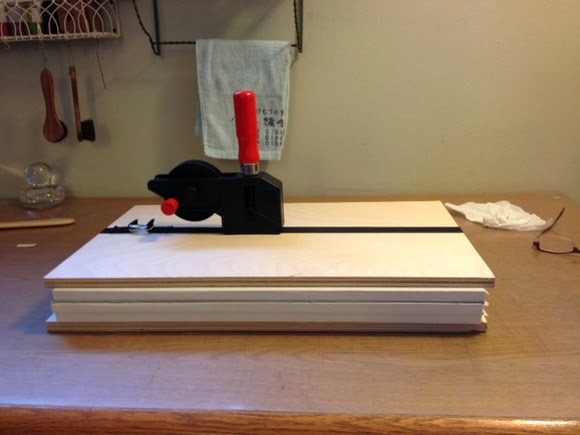 - Artist friend Iskra Johnson made a brilliant suggestion on Facebook: leave about 1/16 inch and then use a sanding block held straight against the panel edge to take it down. I'm a little afraid to try it on these, since my panel edges are also paper, but this would be great if I had primed the boards with gesso instead of washi. 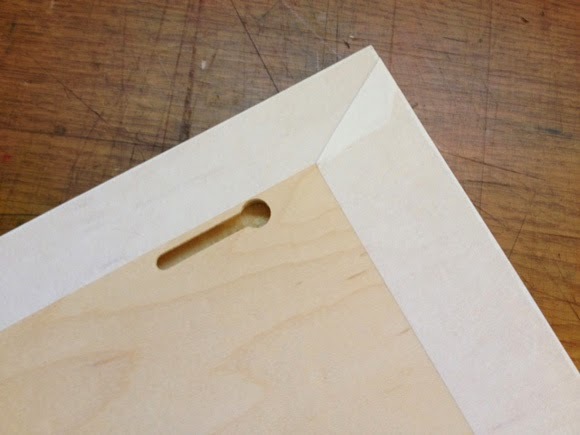 - It should also be possible to lay a straight edge against the panel and make the cut, although you'll end up with an overhang the width of the straight edge. - Go very slowly, and don't pick up the blade until you've cut the entire length. These are just my quick off-the-cuff thoughts. You may very well have better ideas. After I trimmed the two completed prints, I immediately put them into plastic bags to protect them. Although I love not having prints under glass, obviously the surfaces are fully exposed and extra care is required to keep them safe and clean. Next I set up to paste the rest of the prints. The first went smoothly, with no bleeding and easy positioning. (Hannah's suggestion to dampen the wrapping on the panels before applying the pasted print seems to make positioning easier.) But I ran into a new problem as I pasted the next print. 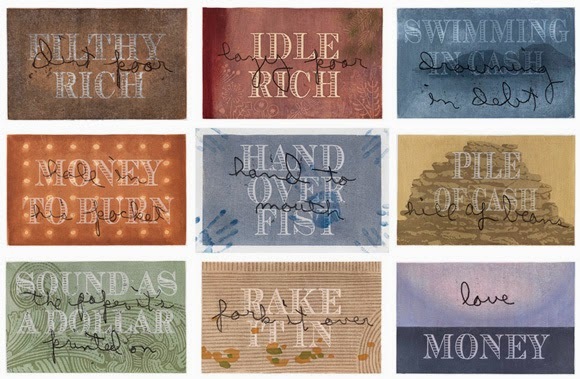 On some of these "Mixed Feelings" prints I had created the lighter font by cutting away the text, but on others I had used white pigment to print the text lighter on top of other pigments, and I discovered that the white pigment reconstituted when wet. It didn't wash away, but it could rub off or smear, so I had to be extremely careful as I softly brushed out the bubbles. 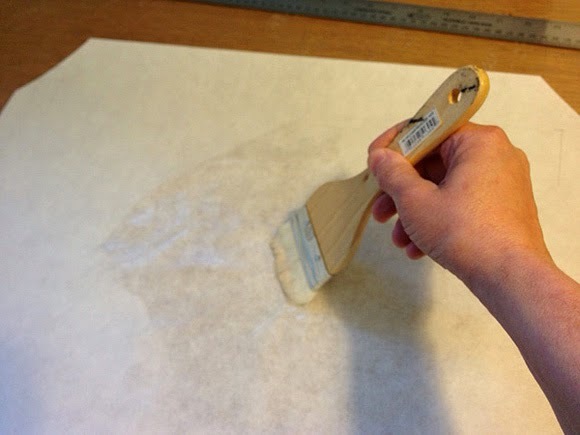 I found that I could use a cover sheet and light baren pressure instead of the brush and avoid smearing. 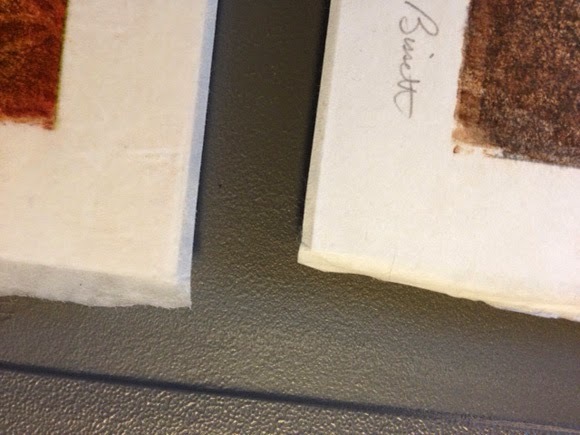 So here's another caution: some pigments stay in the paper just fine and some reconstitute when wet. The top print above has no white ink, but the second and third do. 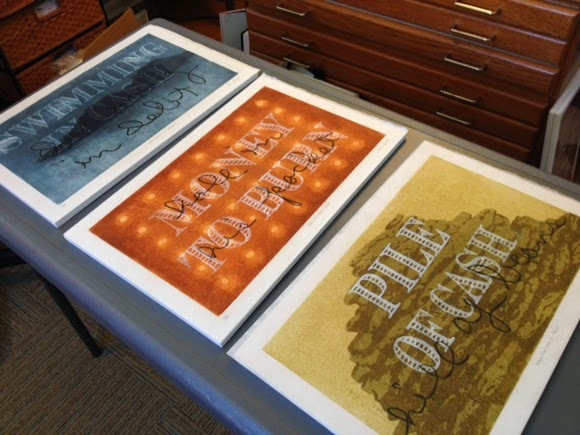 Out of the nine prints, three include white ink. The remaining prints are drying now, and hopefully I'll have no new glitches to report. Thanks for reading! Taking up from where I left off in the last post, the lined boards were now dry and it was time to take the plunge and smear glue all over the back of one of my prints. 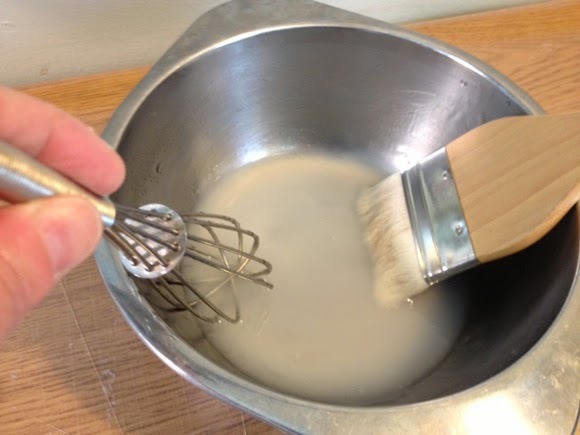 I read via Laura Boswell that the starch paste should be a little thicker for this purpose, so instead of the consistency of whole milk I went for something more like the consistency of cream. I had dampened the prints the night before in a damp pack, just the way I would dampen them to print. I reached into the pack, turned print #1 over onto my work table, held my breath, and started putting on the paste. I watched for bleeding or other types of problems, but everything looked good so I kept going. 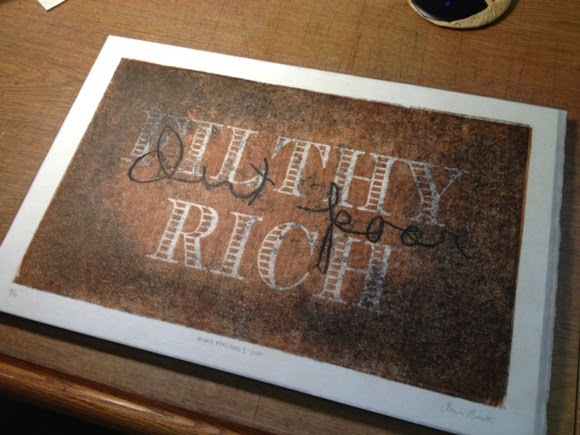 I picked up the paste-filled print, turned it over, and positioned it onto the lined board, just by eye. As I suspected might happen, the print had grown in size from the moisture and was now about 1/4 inch wider than the board and maybe 1/8 inch bigger in height. Nothing to be done about that, but I knew it would be tricky down the road to trim the print without cutting into the lining paper. As I had done when lining the board, I used a soft-ish brush to smooth out any air bubbles or creases and adhere the print to the lined board. 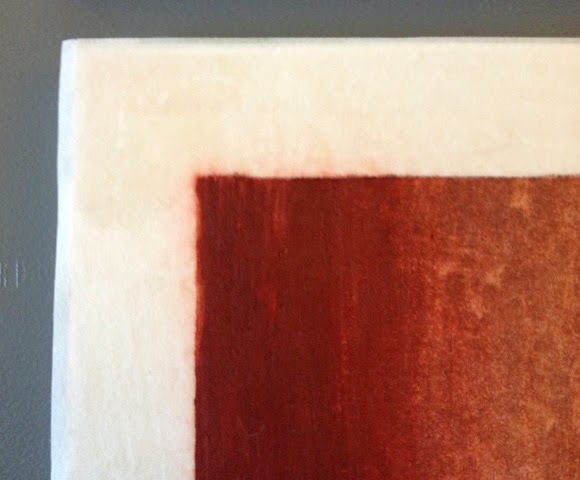 On one edge where I had put a very heavy application of pigment during the printing, the pigment began to bleed. I tried to lighten up on my paste, but it was too late. I decided to keep going, knowing that the color might lighten as it dried. I applied print #2 to a board as I had done with the other one and brushed out the bubbles. At this point I'd like to make an observation about the strength of the bond between the print and the washi I had previously applied to the board. I expected that bond to be very strong, like it would be with glue. But rice paste is not glue. Apparently, the bond occurs in the drying. While the paste was wet, the print could easily be lifted and this concerned me. I had a very difficult time being patient and leaving it alone while it dried — I kept testing a corner, to the point where I had to re-apply some paste in that spot. So my first warning is this: LEAVE IT ALONE AND LET IT DRY! Patience not being one of my virtues, I finally had to leave the room and find something else to do for a couple of hours. Here's a closeup of the corners of both prints. 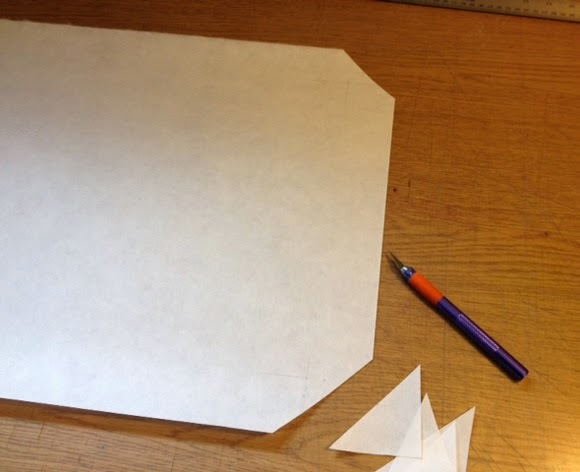 You can see that the paper is larger than the board underneath and will need to be trimmed. That's where things stand this evening. The drying is going well and the bond now appears to be quite strong. Tomorrow morning I'll trim these and try doing a few more. 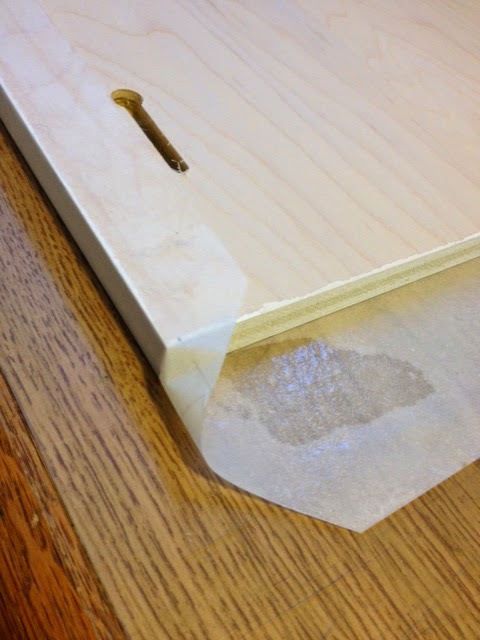 Hannah Skoonberg suggested in a comment on my last post that it might be helpful to moisten the paper on the boards with a spray bottle before gluing, so that the prints and the paper on the boards can dry together. I didn't do that this time, but will try it tomorrow. I'll report again. Happy as I am to have my "Mixed Feelings" prints accepted for the International Print Biennale, the idea of shipping nine framed prints to the UK has been a little daunting. Even the organizers of the show wondered if I could use an alternative to framing. 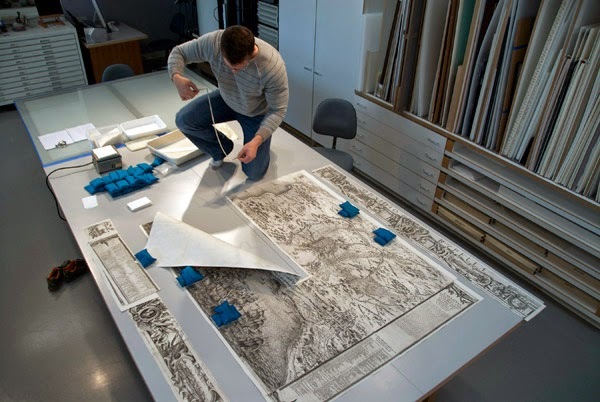 They suggested mounting the whole series onto one or two large sheets of washi in a sort of scroll mount, an idea that I ultimately rejected because it would be technically difficult and also because it would imply that the series was a single piece. I view it more as nine separate pieces that build upon and converse with one another. With the SGCI panel about starch paste mounting still fresh in my mind, I wondered if it would be possible to mount the prints on boards using an adaptation of the Japanese method of byoubu (mounting for folding screens). I met with my friend Louise Kohrman, a print artist who knows a whole lot about chine collé, and with her input I became convinced that mounting on boards was the best option for this series. Last week I ordered art boards and washi and by Monday they had arrived. 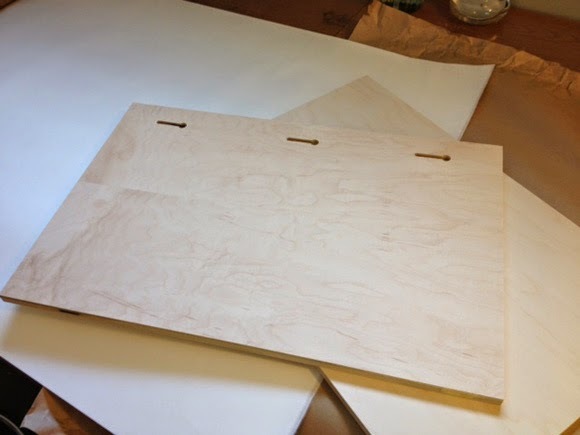 Purchased at art-boards.com, these maple plywood panels are made for painters, can be ordered at custom sizes, and have slots on the back for hanging on a single nail or screw. Art-Boards.com also offers mounting panels with pre-applied heat activated reversible adhesive, but I decided to use the Japanese technique of applying washi to the board and then pasting my prints on top of the washi. 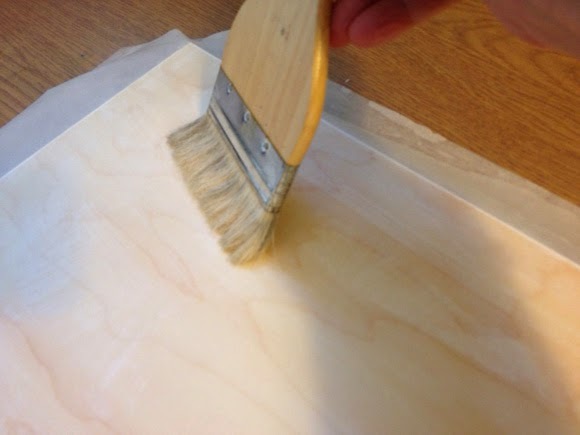 Here's a photo essay on the first step – applying a base layer of washi to the boards. This step may or may not be necessary, but I felt more secure by marking some guidelines to help me know where to place the board. 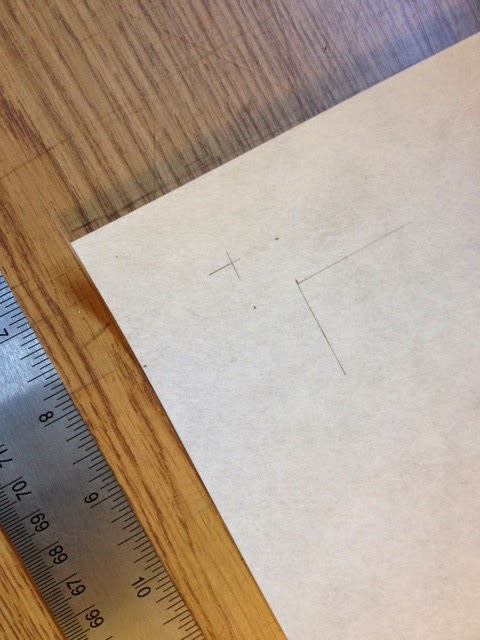 I used my markings to trim the corners so I could neatly wrap the paper around to the back of the boards. I had read (and Louise confirmed) that the paste should be quite thin, maybe the consistency of whole milk. I used prepared rice starch, cooked a two-cup batch and then added water to thin it. I put a lot of paste on the washi, thoroughly soaking it. Using my pencil guides, I laid the board on top of the paste-filled washi and then flipped it over. I used a dry brush to brush the washi flat onto the board and work out any air bubbles or wrinkles. This is a cheap brush. It worked, but if I get into a habit of using this method I'll get a better brush made just for this purpose. Once the washi was adhered to the front, I gently turned the board over and began wrapping the washi to the back. You can see how thin this washi is (39 gsm). It held up well to all the moisture, but I do think it should be just a bit heavier for this purpose. Here's a corner all tucked and brushed. I placed some small woodblocks under the boards to hold them up off the table tops while they dry. 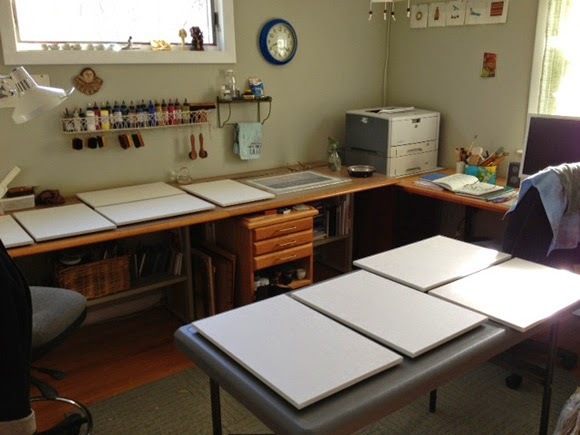 It's projects like these when I really feel the limitations of my little 12 x 13 foot studio. The drying is going well, although the plywood edges aren't adhering like the front and back faces. That's probably because the end-grain edges absorbed the paste too much. Tomorrow I'll do the really scary part and put paste all over my prints! Last month I was pleased to learn that my nine-print series titled "Mixed Feelings" (photo above) was selected for exhibit in the 2014 International Print Biennale, happening June 27 to August 8 in Newcastle Upon Tyne, England. You can read more and see a full listing of the selected artists in this article. The prints will be displayed at Hatton Gallery at Newcastle University. Jurors were Stephen Coppel, Modern Prints and Drawings, British Museum; David Nash RA, Artist; and Susan Tallman, Editor–in-Chief, Art in Print, Chicago. My favorite presentation at the SGCI Printmaking Conference in San Francisco in March was called Before and After the Frame: Pasting and Presenting Wall-Mounted and Multi-Sheet Prints. If you've been reading this blog for any length of time, you're probably aware that I'm not too fond of framing. Framing is, unfortunately, a big part of showing works on paper, so I was excited about this event as soon as I read the title in the conference materials. Organized by Brian Shure, who literally wrote the book about chine collé, the panel included Shure plus master printer Paul Mullowney, artist Emelia Edwards who makes large scale prints that are often paste mounted on walls, and a conservationist whose name I unfortunately didn't catch. - Prints mounted on canvas or wood as substitute for more expensive paintings. - Scroll mounting with wheat paste, drying boards - China. 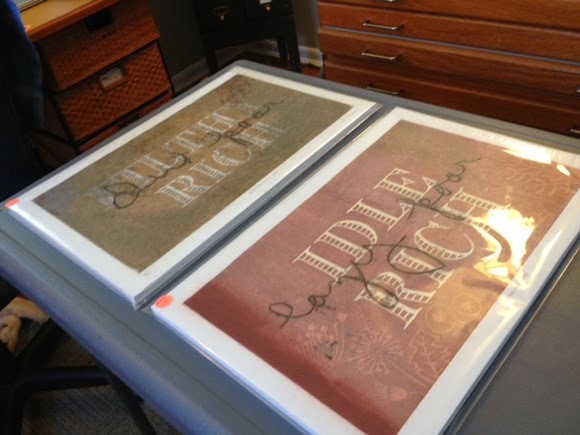 - Contemporary: prints mounted with paste for display, then misted and peeled for safe removal. - Wheat starch paste on 1/8 inch seams, thin gampi, dry it, wet it, back it with large sheet sekishu, brush onto Mylar drying board. - Dried again for a couple of days, then wet again and backed again. Can roll it, ship it, and it rolls back out flat. - Entire edition of 25 can be rolled up into a tube about 10" diameter. How prevent splitting? Dry slowly, with humidity. - Removing tyvek from wall: large scale damp pack (bed sheets, plastic, tape) for about 8 hrs then peel. - Tyvek variables: size, composition of wall, weather, type of tyvek. Sometimes need additives. 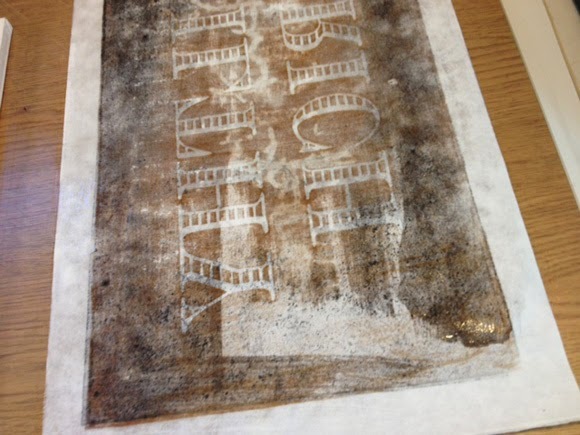 - Now hearing from paper conservator: Never use tape, including pressure sensitive (eg. Filmoplast)! - Linen tape great for mats, but not on the artwork. No Yes paste - stains. "Archival" only means "sold by an archival supplier"
*My next post re: Japanese method of mounting washi (hyougu) on boards will dispute this. Pendleton is an "SI-ECI compartment related to the BULLRUN program." I know, I have no idea what that means either but, fortunately, the Snowden documents have been out there long enough that you can look this stuff up on the internet. Wikipedia defines Bullrun as a clandestine, highly classified decryption program, citing a document that claims that "vast amounts of encrypted Internet data which have up till now been discarded are now exploitable." 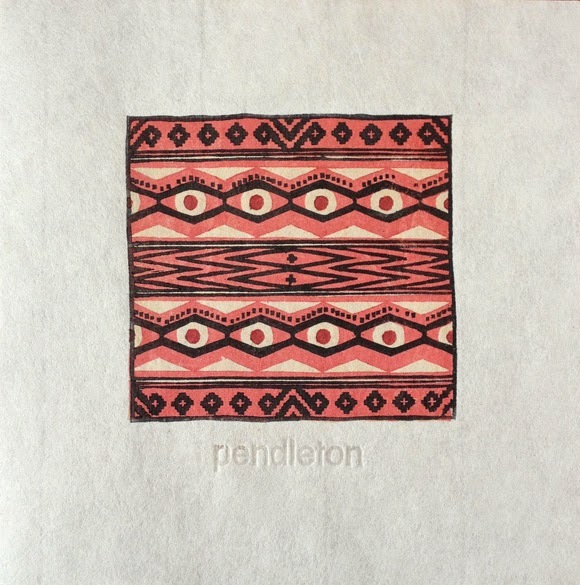 Camp Pendleton is the name of a marine corps base in California, so maybe that's where this name came from, but Pendleton is also the name of a textile company in Portland, Oregon, and I found richer material there. In the late 1800s, the Pendleton mill made geometric patterned blankets for Native Americans in the area—the Umatilla, Cayuse and Walla Walla tribes—and later for the Navajo, Hopi, and Zuni peoples of the American Southwest. Pendleton blankets were sold as basic wearing apparel for the Indians and were also standards of trading and ceremonial use. What do Pendleton Indian blankets have to do with encryption and decryption? Nothing, except for their association with the Navajo people, who among many other things are famous for their role during WWII as code talkers. Although occasionally their own soldiers mistook the Navajo code talkers for Japanese soldiers and shot them, the code talkers had a large role in the Allied success in the Pacific by creating a code from their own language that the enemy was unable to decrypt .